Despite being the father of a very impressionable girl who enjoys fart jokes and insists I take her to all the movies the commercials command her to see, I have somehow managed to go an entire year without putting my eyes on "Alvin and the Chipmunks," last year's live-action upgrade of the long-running cartoon franchise. It was an improbable hit, collecting an absurd amount of box office cash for a movie about characters nobody over the age of 15 admits to liking. A sequel was immediately put in the works. And now, with the DVD being re-released for the Christmas shopping season, I finally get my chance to see the darn thing for myself. If you're old enough to have lived through at least one Christmas, you're aware of the Chipmunks and their dreadful "Chipmunk Song," in which sped-up voices sing about impatience while Alvin yells about wanting a hula hoop. I liked it as a child and now loathe it as an adult, perhaps because radio programmers don't understand that "novelty songs," by nature, should not be played twelve times an hour, every day, every December, until the end of time. They are a novelty. You hear them once or twice, laugh, then move on. Alas, songwriter Ross Bagdasarian was able to build an empire out of his new characters, and over the decades, the three Chipmunks - Alvin, Simon, and Theodore - became staples of children's entertainment. I watched their show in the 80s, but back then, I would watch anything with talking animals. Now my daughter loves the Chipmunks, and I hate them, and I now see what my dad must've thought years ago: I do believe this is making my child dumber, but at least it'll be over soon. Now they've made a movie. The special effects are fairly convincing - and, admittedly, fairly cute - as CGI brings these supposed "real life" Chipmunks into our world. We first meet them singing "Only You" in the woods, until their home is chopped down and taken into the city to be the Christmas Tree in the office lobby of a top record label company. That's where they escape into a muffin basket carried by aspiring songwriter Dave Seville (Jason Lee, following his voice work as "Underdog" with an equally "hey, why not?" performance). Dave is stunned that they can talk, impressed that they can sing. They strike a deal: the newly homeless critters can bunk with Dave if they agree to sing his songs. For side plot material, the Chipmunks prove themselves to be very messy, which causes problems whenever Dave wishes to entertain his potential girlfriend (Cameron Richardson). Dave's greasy music agent pal (Cross) finally hears them sing, and signs them to a superstar deal. "The Christmas Song" becomes a hit, then "Witch Doctor" gets mangled with hip-hop flourishes, and then the greasy agent schemes to separate the Chipmunks from Dave so they can go on a lucrative world tour, and then Dave hopes to reunite with his new furry family, and that's pretty much it. The rest is filled with cheap slapstick, annoying high-pitched singing, and a variety of fart gags, all of which amused my daughter but not me. Here's a movie that reaches its target audience well but without any actual ambition, pumped out through the insta-kid-flick machine. There are a few moments of cleverness - I'm amused that there's no explanation why the Chipmunks talk, and I liked the part of the finale where our heroes decide that lip-synching is for losers - but mostly, it's cute in a bland way, loud in a bland way, funny in a bland way. Somewhere around the halfway mark, I'm pretty sure I thought to myself, I do believe this is making my child dumber, but at least it'll be over soon. One last point, which has already been made by many other critics but will now be made again by me. The Chipmunks are voiced by Justin Long, Jesse McCartney, and Matthew Gray Gubler, three names the target audience may know. But their recognizable voices were then electronically tweaked to sound more or less all alike, as high-pitched singing Chipmunks. Why bother casting them at all? What's the production meeting that day? Clueless Producer: "I got it! 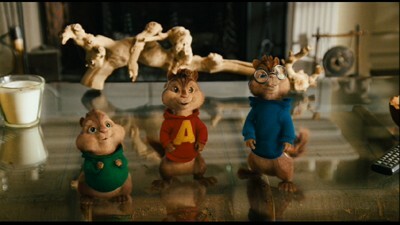 We'll pay big for young stars as the Chipmunks!" Exhausted Assistant: "But sir, we'll be making the voices completely anonymous." Clueless Producer: "Get me a copy of Teen Beat, pronto!" Exhausted Assistant: "Are you even listening to reason?" Clueless Producer: "Make sure the script includes at least one joke about that Pussycat Dolls song!" This new package is a two-disc set in a single-wide case with a hinged tray for the second disc. A Christmas-themed slipcover was included in the copy we received for review, although I wonder how soon after the holidays that packaging will disappear. The animation is the highlight of this 1.85:1 anamorphic widescreen transfer which does the CGI justice, revealing a nice level of detail to the digital critters. Less impressive are the brightly lit live-action parts of the frame - your basic kiddie flick look - which come through decently, if a bit on the dull side. The Dolby 5.1 mix is fairly restrained, keeping most of the action up front. The track never goes overboard with the musical numbers. Spanish and French 5.1 dubs are also included, as are optional English and Spanish subtitles. Two deleted scenes (4:31 total; 1.85:1 anamorphic widescreen) kick off the new batch of bonus material. The first makes the mistake of trying to put jokes about focus groups in a kids' movie, where nobody will care; the second features a limp gag in which Dave daydreams about winning a songwriting award. Next up are two music videos, for "Witch Doctor" (3:44; 1.85:1 flat letterbox) and "The Chipmunk Song" (2:16; 1.85:1 anamorphic). Both use movie clips to flesh out extended performances of these updated versions. "Behind the Nuts Munkumentary" (8:48; 1.78:1 flat letterbox) features cast and crew talking about what it's like to work with those rascally Chipmunks. It's cute for a while, but wears thin quickly. "The Dudes Behind the Munks!" (6:13 1.78:1 anamorphic) features smarmy, sarcastic interviews with the voice cast. There's plenty of clowning around, but oddly, no actual footage of them recording. "Get Munk'd" (21:41; 1.78:1 flat letterbox) is another mockumentary featurette, this one about the choreography behind the Chipmunks; the joke this time is that the Chipmunks' dance moves are sweeping the nation. After about three minutes of overlong setup, we get to the main point: choreographer Rosero McCoy teaches you, step-by-step, how to perform the dances seen in the film. "Chipmunks Live on Tour!" (11:59; 1.78:1 anamorphic) offers footage from the dance-and-comedy concert tour featuring dancers in big chipmunk costumes, mixed with interviews with young audience members telling us who their favorite Chipmunks are and what they liked about the movie. Any parent can tell you that these live things are soul-sucking experiences. "Chipmunk Funk Mixer" is an interactive game that allows the viewer to remix the Chipmunks' song "How We Roll," adding or deleting several audio tracks. A batch of trailers for other Fox titles rounds out the disc. A separate batch of previews plays as the disc loads. Disc Two is taken up entirely by a digital copy of the film. I'm no fan of this new trend - jack up the price by including a disc you'll never use - but if you enjoy digital copies, there you go. Despite the two-disc status, there's not a single extra that's not pure fluff; a quick glance at the earlier release (reviewed here by our own Francis Rizzo III) suggests that, despite slimmer pickings, the previous disc might actually be more substantial. If you already own that version, you can easily Skip this double dip. (And if, unlike me, you're a fan of this movie, that's the disc to get.) Meanwhile, newcomers to the movie looking for a quick evening's entertainment for the kids will do fine to simply Rent It. Either way, there's nothing here that deserves a purchase.